We all have knots in our lives that need undoing; and who better to ask than Our Lady? Join Pope Francis in asking for the intercession of Mary Untier of Knots by praying with this one-of-a-kind rosary handcrafted in her honor. 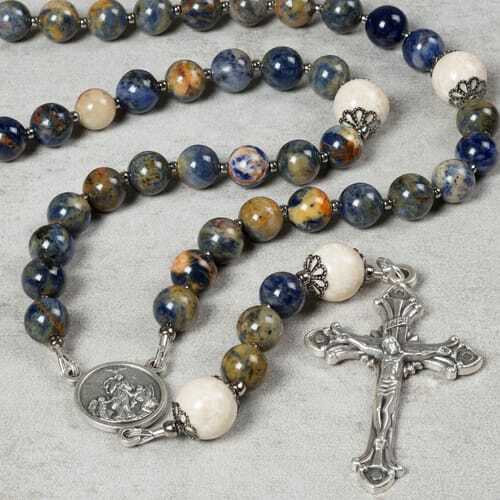 The stunning blue marbled sodalite beads and intricate, capped Our Father beads bring to mind the wonderful way in which Mary enters into our messy struggles and changes everything for the greater glory of God. This Catholic Company exclusive rosary will serve as a striking reminder to turn to Our Lord and Our Lady Untier of Knots when facing our daily crosses. Accompanied by a prayer card featuring the 20 mysteries of the rosary and which days to pray them. the untier of knots rosary is very unusual, I got this, to us as a gift for our daughter, for Christmas, it appears larger on-line than it actually is, otherwise, I am well satisfied. I love this Rosary. I just wish it came with a large size Rosary Pouch to keep it in. The Rosary Pouches that are available for purchase are too small for the large size beads. These beads are lovely to look at and very smooth to hold. I would recommend this beautiful rosary highly. I am very pleased with this Rosary and I had Fr. Treacy bless it. I've just received this rosary and it is beautiful and well made. I'm very pleased with my purchase and know I will enjoy for years to come. This is a beautiful rosary. It is not as large as some rosaries because there is no space gaps between decades. a Very large bead denotes the beginning/end of the decade. I have this rosary very near my 18 inch statue of Our Lady Undoer of Knots which I also purchased from the Catholic Company. This is one of the most beautiful rosaries I have found. It is very well made, and very sturdy. I have looked at many other rosaries and they are usually not worth buying. This is a lasting keepsake. I highly recommend it. Exquisite, Yet Simple & Sacred! This is a beautiful piece with which to pray to Our Lady! Simple, weighty, yet exquisite with its use of natural material. It feels warm to the touch and makes you look forward to spending the time with the Undoer of Knots. I love this portrayal of Mary, the Mother of Jesus. It brings back memories of when you were a child, and you developed a knot in something, and just were so frustrated! You took it to your Mother, who made it better! Mary is our Mother, and she will always make it better!